I want to get this out of the way as a disclaimer because today we're talking about art. Comic book art, to be specific. And I want all of you to understand before we get into this that I'm really not qualified to discuss this. There's a reason why my analysis of films and television is almost entirely story-based. But even I can recognize when a comic goes above and beyond and features art that really enhances the story and changes the feel of the piece. That's what we're talking about today - a comic where the art is such an integral part of the story that it becomes a significant part of the narrative itself. 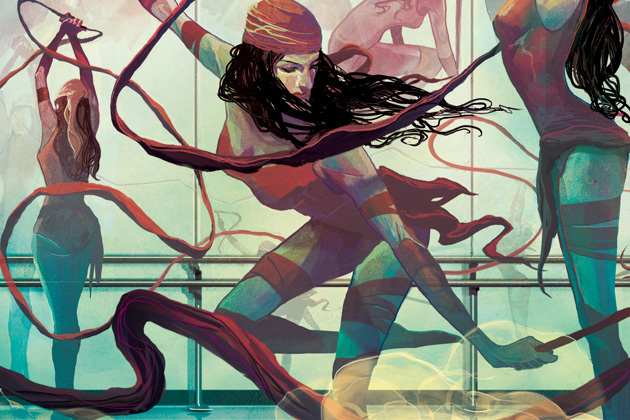 We're talking about the 2014-2015 run of Elektra for Marvel Comics. 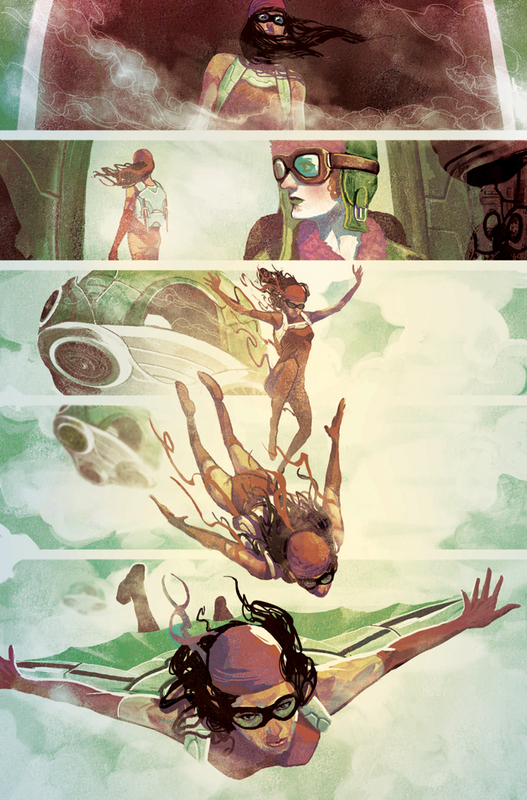 If you managed to miss that there even was a brief Elektra run last year, you're not alone. While definitely one of the most imaginative and compelling experimental comics of the past few years, Elektra suffered from an occasionally uneven storyline and a comics company that had no idea what to do with it. At the time, there wasn't much interest in Elektra as a character, so Marvel kind of made the comic and wanted to see what would happen. When not many people bought it, they canceled the run and washed their hands. Disappointing, but not particularly new. We're talking about it, though, because in those eleven issues before it got canceled, Elektra did more interesting things with art than any ten other comics combined. Particularly when it comes to the art in female-lead comics, rarely is there anything new and different enough to write home about. In this one, there's so much new and different that your brain feels a little overwhelmed, like you're looking straight into a fever dream. 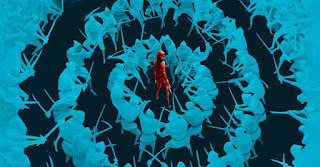 Written by Haden Blackman and illustrated by Michael Del Mundo, the comic loosely follows Elektra's rise to the leader of the assassin's guild in the Marvel universe. I say loosely because the plot really meanders all over the place, introducing a terrifying new villain in Bloody Lips, a couple of old foes who become uncomfortable allies, and a giant confrontation with Lady Bullseye. The comic really wanders around, developing the main story arc, sure, but most exploring Elektra as a person. It's not so much about the destination here, but all about what we learn along the way. This version of the story takes Elektra from where she is later in her life than usual. She's still young and athletic and dangerous, but this is after her time as a bad guy and also after her time trying to redeem herself as a good guy. It's after the whole mess with Daredevil and all the usual stories we see her in. Here, Elektra isn't after revenge or redemption or anything in particular. The story finds her actually just living her life, being an assassin and being who she feels she really is. But the events of the story force Elektra out of her comfort zone of murdering people for money and make her actually take a long hard look at her past. In order to defeat her enemies, she has to face down her childhood traumas and genuinely examine who she is. A new character with the power to send people into their own heads certainly helps with this, but the real draw is watching Elektra finally start to integrate the pieces of her past and become a more whole person. That she does all of this while facing down the assassin's guild and straight up taking them over is just a bonus. I'm sure you're wondering now how the art plays into all of this. The story should stand on its own, right? Art in comic books is usually competent, but rarely beautiful. With the exceptions of artists like Alex Ross (who I have to admit to not really liking) and Marco Rudy and Fiona Staples, your average comic art is functional and tells the story but doesn't delve into too much detail. And I'm not saying that's a bad thing either - I love the art in Lumberjanes and Black Canary and everything Phil Noto does** - I just want to draw a distinction here that there's comic book art that tells a story, and there's comic book art that is straight up art. Elektra, as I'm sure you've guessed, is the latter. It's art, these beautiful paintings that wouldn't be out of place in a gallery being used to tell this compelling and bizarre story about a woman running from her demons and fighting everyone who gets in the way. The pictures flow from one side of the page to the next with panels barely a suggestion and the whole thing makes you feel almost woozy. In a good way, if that's not clear. 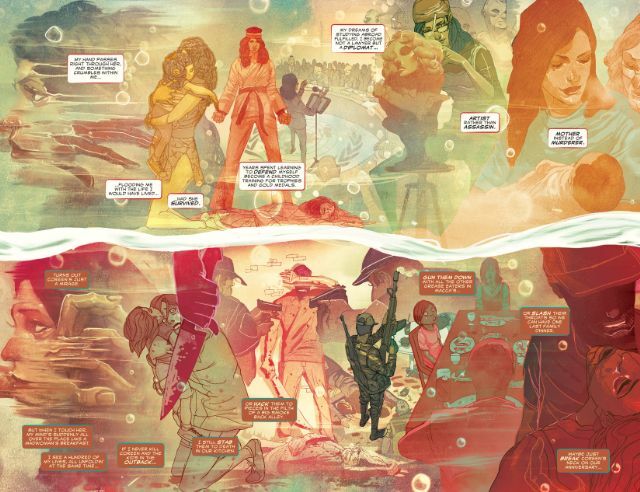 I really mean it when I say that the art in Elektra, the work that Del Mundo has so clearly put into that book, pays off in how it changes our understanding of the story itself. Without that art, the story is pretty flat. It's your standard action movie where a woman is being hunted and fights back and eventually faces the big bad and wins. Done. Slap some spandex on the latest Hollywood starlet and you've got a perfectly reasonable movie. But because the art is so expressive and surreal, the rest of the story becomes deeper, richer, and more meaningful. 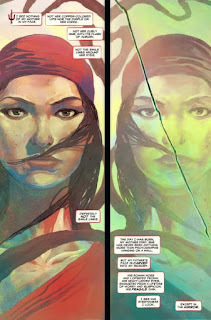 Without Del Mundo's art, Elektra would probably still be good, but with the art it's so much better. And that's what I'm getting at. Good art, particularly in a visual medium like comics, has so much potential to elevate its story. It can change how we understand the characters and their struggles. I mean, think about it in the opposite direction too. Art that is clearly meant for titillation, art that mimics Rob Liefeld's grossly exaggerated misunderstandings of human anatomy or art that seems to be confused about how breasts work, detracts from its story. You find yourself not taking the plot or the characters very seriously because the art does nothing to add to the story. Since the art is clearly there to objectify the female characters, we don't care about their emotional struggles. Elektra does the exact opposite. 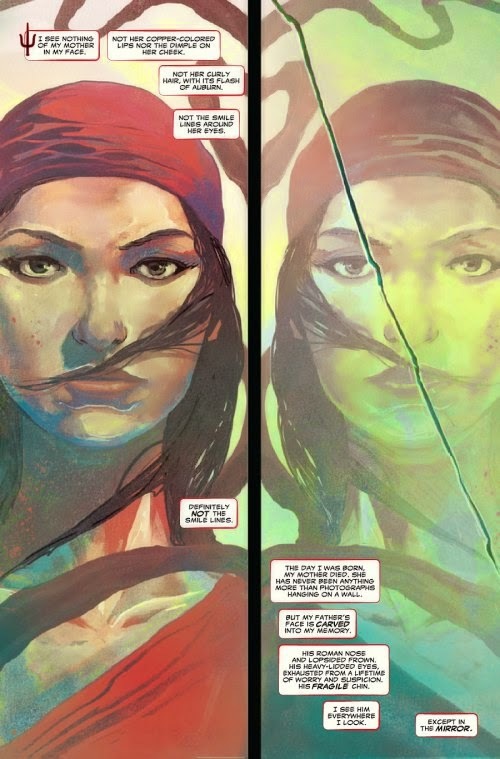 The art is so good and so personal and so beautiful that we can't help but find ourselves deeply invested in Elektra's journey. That's how art is supposed to work. I don't have some larger philosophical point today, I just thought it would be nice to share a neat thing I happen to really like with all of you. I was pondering this comic series as I got ready to watch the upcoming Daredevil season, wondering if Elodie Yung's performance as Elektra would in any way mimic this comic's perception of her. I don't mind either way, but I've discovered I have a favorite version of her now. And I don't think that my preference for this Elektra, the broken woman still haunted by her childhood but who desires excellence in everything she does, is entirely down to the story she's in. I actually don't care much about the story at all. I fell in love with Elektra because of the emotion and the power in the pictures on those pages, and I want you to feel the same way. There aren't enough beautiful things in the world - it's worth celebrating the ones we get. *This has not, for the record, been any deterrent to my enjoyment of art museums, however. Everyone else in my family is either supremely visual or a literal visual artist, so I spent most of my childhood strolling through art museums and developing mild preferences. So while I can tell the difference between a Rembrandt and a Caravaggio, that's more Stockholm Syndrome than anything else. I prefer the early modernists, like Chagall, but mostly because it's pretty and colors are nice. **Side note, but has anyone else noticed that Phil Noto draws exactly one kind of face? It's started to freak me out. Everyone looking for the best and leading design company, for the work of logo designing of their company, but some of us better knows the right person for the work of designing logo and other graphical work like this ilustra.co.uk/, which Is popular due t his work of designing and illustration.